A few weeks ago, while surfing the web, I happened upon a Huffington Post article entitled “Seven Things Your Wife Isn’t Telling You She Needs.” I know that sounds like vacuous clickbait, but author Brittany Wong serves up some good tips. I know this because I clicked on the article, something I never would have done if it hadn’t been accompanied with a pitch-perfect Getty Images stock photo of a brunette, twenty-something woman contemplating her ennui while an out-of-focus husband reads a book in the background, oblivious to his wife’s glum mood. The woman is attractive, but not in any way that overshadows the malaise communicated by her facial expression. The stock husband is shown from the neck down. He could be any guy—including me—which of course is the point. Taken together, the two models come off as a sort of perfect everycouple. Stock photography at its finest. When I entered the photographer’s name (Eric Audras) on the Getty Images search page, I found the sale specs for this shot. It’s called “Woman leaning on elbow looking sad, man reading on sofa in background.” Along with this description are “keywords” that correspond to applicable search terms: “Couple, Relationship, Sadness, Boredom, Sulking, Women, Married, Relationship Difficulties, Wife, Disappointment, Focus On Foreground, Young Couple, Contemplation, Domestic Life, Sofa, Two People, 25–29 Years, Hand On Chin, Heterosexual Couple.” The ingredients in this word salad are crucial: Even the best photo won’t sell if it doesn’t land on an editor’s screen at the right moment. I know a good story when one falls into my lap. “Serious question: could my wife (Jen) and I pose for one of those?” I tweeted at Groner. Amazingly, he said yes. Jen said no to a grumpy bedroom shot, but did agree to pose for a business-themed photo shoot at The Walrus office. Click through the Shutterstock database, and you find that professionally shot and curated stock photos invariably exhibit what might be called calculated soullessness. The subjects project human emotions—happy, sad, confused, angry—but in a simple, one-dimensional way. There should be nothing bespeaking a complex inner life. Real human interest always will distract the audience from the intended product or idea. I’d always assumed that stock photos were edited aggressively. But Newman’s edits were minor. In a photo of Jen and me talking across a desk, for instance, the computer cables on the right side of the frame have been deleted. In another shot, she has adjusted the spacing of my wife’s lips. Where the word “Walrus” is visible in a background poster, Newman intentionally garbled the text. “One of the most important elements of the Shutterstock quality-control process is to ensure there are no logos or other brand identifiers,” she told me. “Nor can the photos contain identifiable people or locations which haven’t released their legal rights.” The blackouts here can be extremely broad, and include some of the most famous landmarks on the planet. You can’t include the Eiffel Tower in most forms of stock photography, for instance. Nor can you include anyone wearing the iconic beige-and-blue Burberry pattern. Even a tiny patch of it in the background renders an image completely unusable. Newman’s photos are technically impressive. But there’s also something artificial about them—and not just the ordinary artificiality that suffuses any posed photo. With our broad smiles and upbeat body language, Jen and I are putting on display an idealized style of white-collar interaction that has been the object of popular satire since the rise of Dilbert and The Office. How many people in real offices sit across uncluttered desks from one another, smiling all day? Which raises the question: How does a photographer achieve authenticity in an age where authentic culture increasingly is built around irony? More broadly: Is the project of organizing human experience into databases of generic happy faces and sad faces still relevant to us in 2016? I put the question to Jim Pickerell, the Maryland-based author of Selling Stock, the industry’s leading source for trade news. What has changed are the underlying economics. Pickerell began his career with a bang half a century ago as a freelancer in Saigon. On November 1, 1963, he was the only stringer with colour film in his camera when South Vietnamese president Ngô Đình Diệm was deposed by military insurgents. 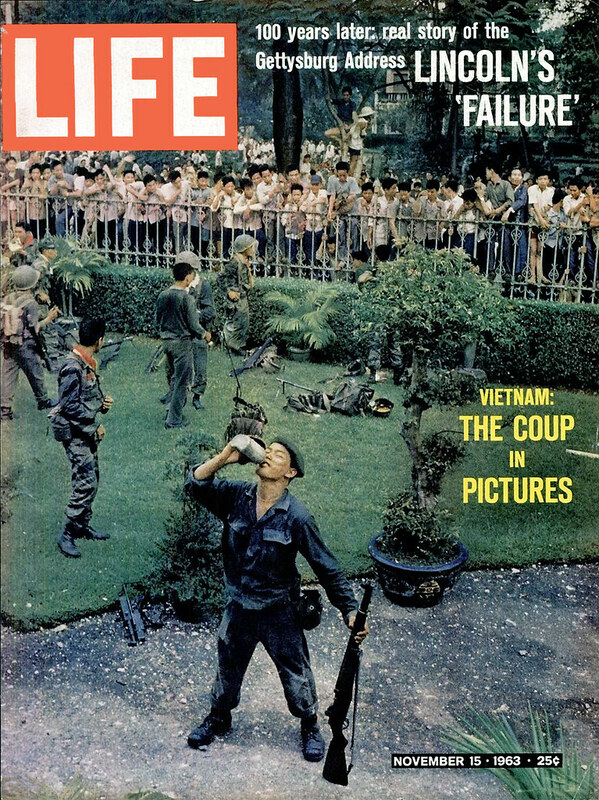 Pickerell’s iconic image from the presidential grounds made the cover of Life magazine. “Since I was shooting on spec, not for any particular publication, that was technically a stock photo,” he says. Life paid him $350 (US). And he stayed working as a full-time photographer until well into the 1990s. Pickerell tells me that even major media sites (such as, say, a Canadian newspaper) now might pay only a dollar or two for the use of a typical stock photo. And smaller sites may not pay anything at all—because they just steal what they want from the web. “The data I’ve seen suggests that about 80 percent of images online are used without a fee,” he says. A few days after my close-up, Newman informed me that our Walrus office photos had passed Shutterstock’s quality-control process, and became available for commercial purchase on the company’s web site. Apparently, they’ve already been downloaded by at least one paying client—which raises the exciting prospect that Jen and I might soon see ourselves in an ad for office products or tax-preparation software. Remember the episode of Friends where Joey unknowingly ended up in a public-service announcement for venereal disease? In the real world, apparently, that could never happen.